As we know, a home renovation or the purchase of new items can be quite expensive. So is it possible to renew your home’s interior and add some colorful accents without spending a lot of money? 5 Fun Facts found out that it’s quite possible. Here are 20 low-priced ideas for renewing your interior design that are worth taking note of. Want to change something in your bedroom? Here is an idea: you can decorate the bed skirt with bright yarn tassels. Read this article to learn how to do this. There are plenty of ways to repurpose your old furniture. An old table or unused chairs can be turned into something new and useful. Here are some examples: 1, 2, 3, 4, and 5. This is another way to decorate your house with yarn. You can make cute soft rugs of this material, and knitting skills are not required! You can even use your old clothes. There is also an easy option, which is perfect for a nursery, and it’s a pompom rug. How to renew old tiles in the kitchen or bathroom without a big expense? Turns out, you can paint them. Here is an instruction. Your favorite cup is broken? Don’t be sad! You can use the broken pieces to decorate some flowerpots. Here is an instruction on how to do it. By the way, you don’t need to break dishes because you can use river rocks as well. It’s not only old furniture and clothes that are good for creating new pieces of interior decoration, as doors are quite useful in this case too. Check the details. If you spend a lot of time sitting in such a chair, you probably want to make it more comfortable. Here are two ways to make your office chair softer: 1, 2. Such a beautiful frame will turn any mirror into a masterpiece. You don’t need to be an artist to create this piece of decor, it’s all quite simple and inexpensive. Your guests will never guess what the frame on the right is made of. Click for the details here and here. Despite the fact that fake fireplaces don’t heat the room, they’ll make your house very cozy anyway. You can put some candles in it or use the fireplace as a shelf. 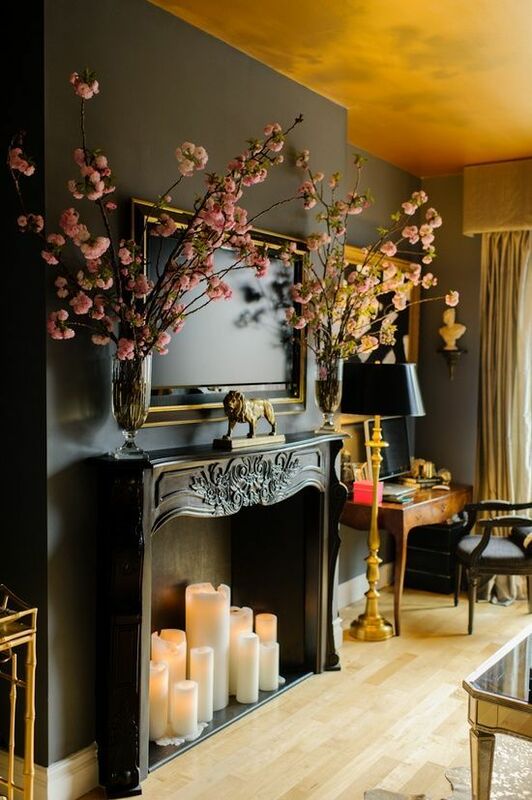 Read this article to learn how to create such a fireplace yourself. An easy way to create a nice tieback is to use fabric tape or beads. But if you have spare time, you can try to sew a tieback yourself. Walls that have Moroccan-style patterns on them will make any room look very chic. You don’t have to look for a suitable wallpaper with patterns as you can create it all using a stencil. If you don’t like the idea of using paint, you can also decorate plain walls using a special tape. As with the mirror frames, it’s hard to guess what material these chandeliers are made of. We promise you, they are made of the easiest material. Read these articles to get more details: 1, 2. You can’t get rid of old clothes? Well, then don’t. It’ll be much better if you turn them into new cushions. Here are the instructions. You can make cool shelves using old picture frames. Read this article to get to know how to do this. You think this wall panel is too expensive? Actually, it’s no more expensive than a high-quality shower curtain. Check out the details. Such beautiful lamps can be made of regular vases or glasses and your favorite pictures. A great way to renew the interior is to replace regular curtains with roman shades. And you can make them yourself by the way. Take a look at this article to learn how to do this. It’s not necessary to buy a new bed, because you can transfigure your old one. We have two examples on how to do this without spending a lot of money: 1, 2. This decoration will be safe if you use LED lights that don’t get hot. It’s also a hanger as well as storage for different bits and pieces. Check this article to find out how to create this practical board.